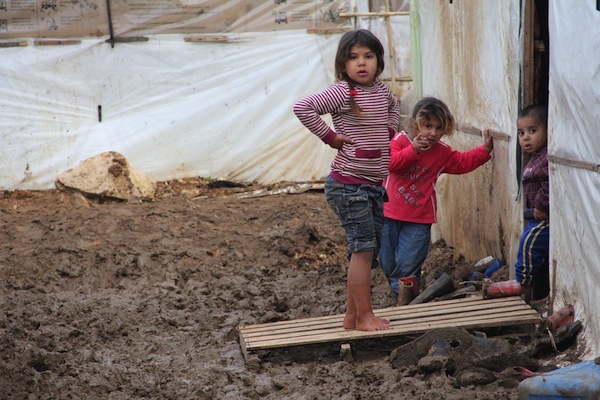 Syrian refugee children learn to survive at a camp in north Lebanon. Credit: Zak Brophy/IPS. WASHINGTON, May 14 2013 (IPS) - Humanitarian assistance groups in Washington are warning that the health care system has become a deliberate target in the increasingly brutal civil war in Syria, presenting major challenges to addressing the humanitarian and refugee crises spurred by the conflict. In a meeting with U.S. President Barack Obama on Monday, UK Prime Minister David Cameron stressed the centrality of the unfolding health crisis, emphasising the need in Syria to “care for trauma injuries, help torture victims to recover, [and get] Syrian families clean drinking water”. Health aid is meeting significant obstacles, though, as the public health system in Syria reportedly has been largely dismantled after being targeted by Bashar al-Assad’s regime, which has wiped out a third of the hospitals in the country. According to the Violations Documentation Centre, a Syrian human rights organisation based in Damascus, 469 health workers are currently imprisoned in Syria. Tom Bollyky, a senior fellow at the Council on Foreign Relations, a Washington think tank, estimates that around 15,000 doctors have been driven out of the country. Bollyky noted that these attacks are one conflict’s manifestation of a disturbing global trend in which medical facilities and personnel become more frequent combat targets in conflict zones. In a March report, the Independent International Commission of Inquiry on the Syrian Arab Republic accused the Assad regime and opposition groups of strategically targeting medical facilities and personnel. "Attacking medical personnel is a way of depriving a population of the humanitarian support they need." “Attacking medical personnel is a way of terrorising a population and depriving them of the humanitarian support they need,” Bollyky told IPS. He pointed to similar instances in the Middle East and Asia, particularly coordinated attacks by the Taliban on polio immunisation volunteers in Afghanistan and Pakistan. On Monday, the Taliban announced it was halting its years-long effort to sabotage the campaign to eradicate polio among children in these two countries. Such attacks are specifically outlawed in the Geneva Conventions, which entitle hospitals and medical staff to protection from hostile fire. The targeting of the Syrian health care system has not only left those wounded by combat without urgently needed care but has also exacerbated a public health crisis brought on by the poor living conditions of refugee camps outside of Syria. Refugees from the conflict currently number more than one million, and the United Nations is warning that figure could swell to 1.5 million by the end of this year. That number is dwarfed by the more than 4.2 million Syrians who are displaced within Syria. In addition to the systematic targeting, Syrian medical facilities are reportedly being “cannibalised” to serve military ends. Zahir Sahloul, a doctor with the Syrian American Medical Society, told an audience on Friday about the looting of the two main hospitals in Aleppo – an eye hospital and a children’s hospital – that now serve as bases of operations for military battalions. Chronic illnesses that were relatively easily treatable before the outbreak of the conflict – diabetes, or high blood pressure, for example – are now deadlier than ever, leading to what MSF’s Cornish called “silent casualties”. These patients can’t be referred outside of the country because they aren’t considered emergency cases. But they also can’t be treated inside Syria because the necessary facilities and healthcare providers simply don’t exist anymore. Health workers are increasingly ill-equipped to deal with these growing problems, expert say, as their capacities are being undercut by suspicions over loyalty. “In Syria, if you are a physician who is…’treating people from the other side’, you put your life at risk,” Sahloul said. As humanitarian groups try to find solutions to the challenges to health and humanitarian assistance, observers appear united in their calls to the international community to ramp up pressure on both sides to stop hospital and medical staff attacks and to have more respect for international humanitarian standards. Geneva Call, a non-governmental organisation in Geneva that focuses on engaging non-state actors in international humanitarian law, released several short video spots promoting respect for international humanitarian standards. One of the videos’ titles was “Respect and Protect Medical Personnel and Objects”. Tom Bollyky suggested that treating these violations with more seriousness in the International Criminal Court– and recognising the international community’s responsibilities in combating them – would be a step in the right direction.